This Thanksgiving, I have the flu. And then, there is my husband. He couldn’t sleep last night. But he still got up and made waffles for breakfast this morning. and then quesadillas for lunch. That man…no wonder I named the cafe in Looking Glass Lake after him. He makes being sick almost a happy thing. With so much love around, even the flu can’t shake me out of THANKFUL MODE on this Thanksgiving! So for all those men out there…those rare men who cook meals and do the dishes when their wife is sick…you get it. You know how to love. For real. You might like my books because I write about real love. 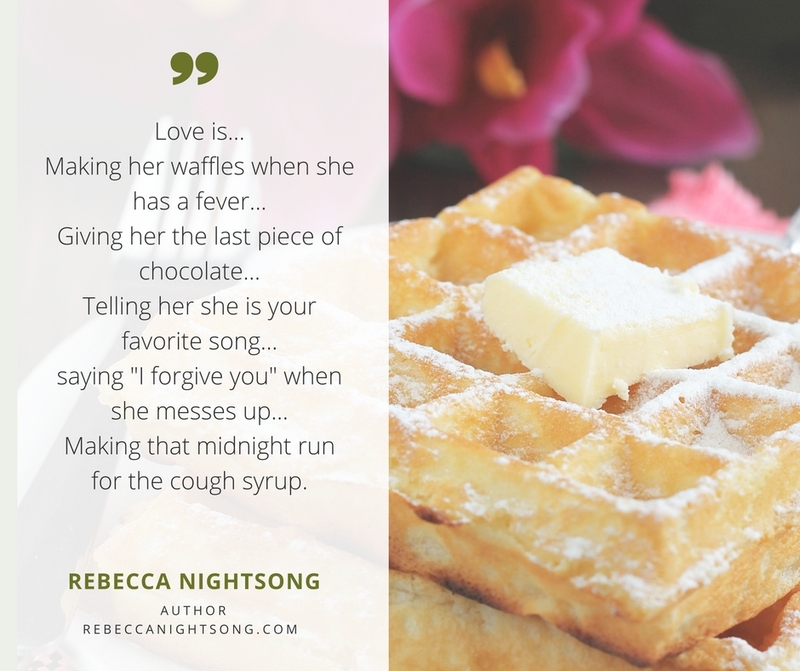 And sometimes I write about waffles. Today is the day my next book, Love’s True Home, is released on Amazon, and my heart is just full to bursting with joy and gratitude! And it has a lot to do with the sparrow’s song. Let me back up a little bit and tell you the story…. My Grandmother Winifred was a gentle and quiet lady, and I miss her dearly. Like me, she was very short. But she had a powerful voice with a sweet and clear tone. She and my Grandpa traveled and started new churches throughout the nation. When re-visiting those churches in later years, people always begged her to sing. 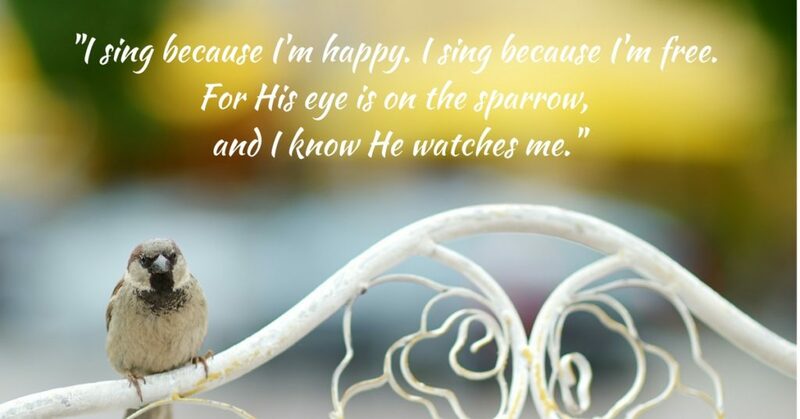 And when she did, she always sang her signature song: His Eye is on the Sparrow. Back then, my young ears could not yet appreciate the vibrato of an opera voice, and I am ashamed to confess that I was guilty of snickering a bit as foolish children will do. But since then, I have grown to value her singing as I have gotten older. I remember how the church would hush just before she began. There was electricity in the room. Even as a kid, I understood that though the vibrato didn’t impress me, folks in the pews were anticipating something great. Those words stirred something in me, but I didn’t know what. I just knew emotions swirled, and there was a kerfuffle of things happening in my soul. Things I didn’t understand. Then I forgot them and went about my daily life, riding my bike off jumps, picking at scabby knees, bottle-feeding baby calves, and raising my doll-babies. But now..years later, after Grandma Winifred has passed on, I have just endured the darkest and longest storm of my life. It has lasted for years and isn’t over yet. Chronic illness, a financial hurricane, painful betrayals, uprooting, losing family members, gut-wrenching ongoing losses, and the onslaught of multiple crimes committed against us…all these things have been wave after wave of an ever-darkening storm that have hit my husband and I over the last few years. And yet…this book, Love’s True Home, was born in the middle of that storm. It is my sparrow song. Without God, the storm would have crushed me. But He placed the song in my heart, and He made it rise and swell and take flight. If you would like to get your copy of Love’s True Home today, you can find it here on Amazon. What are your favorite songs that help strengthen you in the storms of life? My manuscript just arrived in the mail from the proofreader. That means this book is almost ready for release. It also means I get to reveal the cover for Love’s True Home. My cover designer, Rachel Ault did a fantastic job. I’m starting to get so excited, I’ve got butterflies in my tummy, ants in my pants, and jitters in my boots. 😀 I can’t wait to share this story with you all. Matthew Paycoach, the cowboy who never stops with the practical jokes, won’t know what to do with icy Lauren Rolphe when she comes to town. But Fern Aimstock and Crazy Hoss know exactly what to do! 😉 They ALWAYS know what to do when it comes to matchmaking. Okay. Back to edits. Because as soon as I’m done with that, I’ve got to move on to Meg Aimstock’s story…and she’s anxious to get to work with her mustangs! Today, I am starting the launch of my second book. 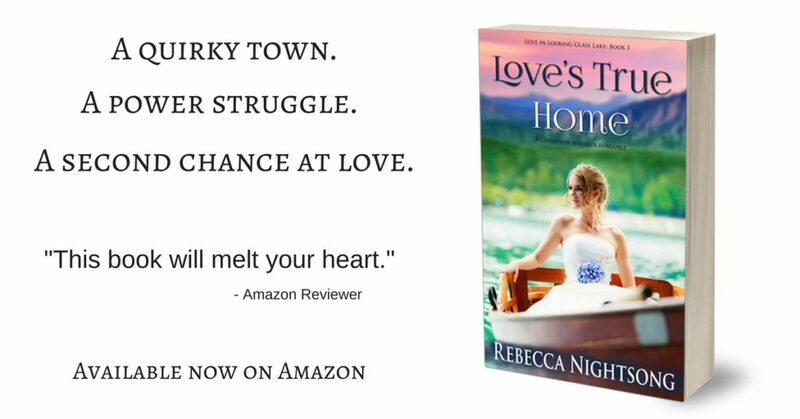 ‘Love’s True Home,’ Book 1 in the Looking Glass Lake series, will release on Amazon on September 2nd. I’m so excited, I’ve got butterflies in my stomach all day long. But do you know what can bring those butterflies down real fast? Yeah, you heard me. So a little while back, I posted about how clean laundry in my house is only possible because I listen to Heather Blanton’s audio books. And that’s mostly true. The part that might be just a smidgeon not-quite-true is that I was leading you to believe that I was even doing laundry AT ALL during that week I was frantically trying to finish edits on my book! So that means, I have Mount Laundry to tackle this week. Hopefully, it won’t be too long of a climb to catch up. Now, I know what you’re thinking. Woman cannot do laundry with one audio book author alone. At some point, you run out of books. And you’re right. That’s why I’m embarking on an adventure listening to Karen Witemeyer’s book this week. Never fear. I will share! Can you believe that not only are Karen Witemeyer and Heather Blanton amazing authors, but they’re sweet as Sunday morning, too! I asked them if they would be interested in a giveaway, and they said YES! Yay! This is so fun! 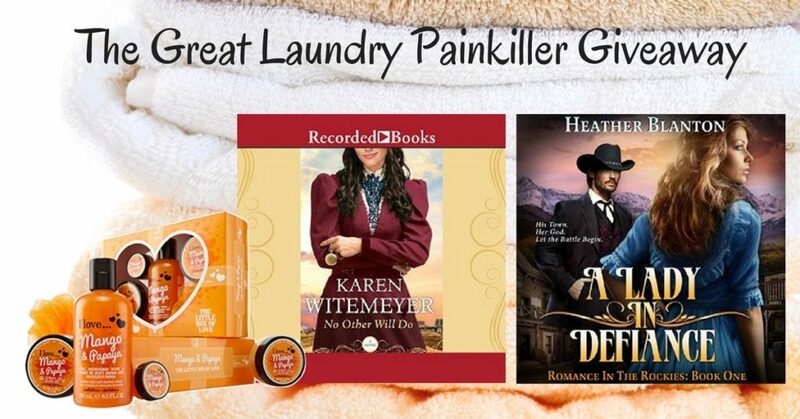 You can enter to win two audio books AND a fun little spa package by going here. Why two adio books? Do I really think you have THAT MUCH laundry? Yikes, I hope not! 😀 I just wanted to give you both of my favorite audio book authors. So in this package, the lucky winner gets both Heather Blanton’s and Karen Witemeyer’s books. Isn’t that what the doctor says about pain: take TWO and call me in the morning? So, yeah…couldn’t make you try to get by on only one. So enter here, and don’t forget to share your lucky url with your friends…because they have laundry, too. Oh, and also because the more you share, the higher your chance of winning. Tired mommas, never fear…the laundry pain-killer is near. Because as we all know, LIFE IS TOO SHORT FOR BORING FOLDING!